For a long time Yahoo! competed with Google as the major search engine. Yahoo! is a publicly owned corporation and its headquarters can be found in Sunnyvale, California in the US's Silicon Valley. They provide Internet services across the globe including a web portal, search engine, email and directory services. It also provides social media websites and services. The company was founded in 1994 by Jerry Yang and David Filo, becoming an official entity in March, 1995. The founders were Electrical Engineering graduate students at Stanford University. The original name for Yahoo! was "Jerry's Guide to the World Wide Web" and was later renamed. The site quickly gained viewers and by the end of 1994 the site had amassed one million hits. It was this amazing response which prompted Jerry Yang and David Filo to make the venture into a profitable business. During 1999 and when the ".com" bubble was at its height Yahoo! doubled their stock value on the stock exchange. Japan followed this trend only 16 days later and Yahoo! had the highest trading value in Japanese history at 100,000,000 yen. Yahoo! progresses and acquired other search engines to boost its services. 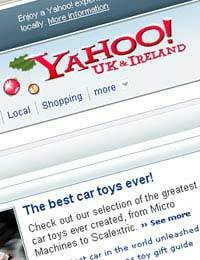 This included Inktomi in 2005 and Konfabulator, which is now known as Yahoo! Widgets. It also acquired the Overture services, in addition to Alta Vista and AlltheWeb. For a while, Yahoo! used Google's technology to power its search engine but reverted back to its own technology in 2004. It seems this has emphasised the rivalry between the two biggest search engines, but currently in 2008 Google seem to be winning and increasing their lead over Yahoo! as the worlds leading search engine. Despite living in Google's slipstream various Internet rating sites such as the Alexa rankings show that there are approximately 1.575 billion visitors annually as of 2008. In terms of page views this amounts to 3.4 billion page views, taken as an average in October, 2007. It is reported to be the most visited website in the world, however. Unlike Google who have only recently started to provide a portal for users in addition to a search engine, Yahoo! have been running one since basically their inception. The modern Yahoo! portal offers a number of services both on a global and international level, with versions being available for specific countries, such as the UK (.co.uk). On the Yahoo! front page you will find news items, sport, video, email and Yahoo! Messenger which is a rival to the Microsoft version, MSN Messenger. There are also games, music and weather forecasts, in addition to a number of services and groups for members to join, such as discussion groups. You can even have a daily horoscope if you so wish. There are links to other useful sites such as Flickr the image sharing site, which is also provided by Yahoo! The interface for the portal is pleasing to look at and easy to use, with navigation buttons provided as standard. Of course, like most websites these days there are advertisements in abundance, but not too many too put you off from viewing the site. Recently, the company was having financial problems and Microsoft offered to buy them out, but the offer was rejected as not being enough to allow the deal to go through. Yahoo! are still going strong but will need to pull out all the stops in order to compete with Google as the number one search engine.